A few years ago, I sat in a hostel room, and thought very very hard about all the problems in my life. Each solution I came up with created a different kind of problem. I progressed along the path, working my way through each potential solution, trying to plug in holes, but the problems seemed to get bigger and bigger and towards the end, there was only one solution left: dying. Suicide. But that word didn’t enter my mind, it didn’t strike me. Maybe if I had been able to think ‘I am considering suicide’, I would have also eventually ended up at ‘Whoa whoa, something is going wrong here, got to take a step back’. But all I thought was ‘Well, I need to die’. Now this happened many times over the course of that summer and the following semester. I would be the ﬁghter I’ve always been and try to work my way out of difﬁcult situations. Problem? Well, what can we do about it? The brain of mine that usually came up with excellent answers to this question started wreaking havoc now. Problem? What can we do about it? Nothing, we’re doomed, we’re pathetic, we’ve messed up, there’s no redemption, we’re awful, we’ve done everything wrong, we’ve failed at life, the only thing left is to die. That’s all I could hear. It is something I still ﬁnd hard to wrap my head around. Dying seemed like the only solution but it never did strike me that I was not well, miserable, terriﬁed, not normal. How? I did not know that I was not happy. How! I didn’t realise there was anything not right about the situation because that was the only reality I knew. I was my biggest problem. Normal world, failed life. Boom. Where did happiness even come into the picture? Die, Ramya, die. Stop trying to see how you can ﬁx anything because you’ve messed your life up spectacularly and life doesn’t give you a clean slate when you ask for it. I did not mess anything up. Certainly not in such a fatal way. But who knew back then? Perspective went right out of the window. It was followed closely by all the faith I had in myself. The following 14 months or so are now a blur of tangled events, memories, emotions, fear, so much fear, and a dark obsession with death. Add some rage and paranoia to the mix, and voila, I have no idea what you’ll get because my memories are scattered and vague. Every part of me broke down except the one that pushed me to protect my parents from myself. I felt like I was tightrope walking. If I’d wanted to burrow into my bed earlier, now I wanted to scream, rage, run away, and keep running till identity wore out, till nothing was real anymore. Situations eventually changed. I was tired, so tired. What was the point of anything? Another year went by. I don’t know how. Somewhere in between, I began to consider getting professional help. It seemed so complicated. Who? When? What would they do? How would I know if they knew what they were talking about? Reliable information was scarce and I didn’t get too far initially. So I told myself I could learn to get by. Periods of joy interspersed with bursts of burning passion and enthusiasm strengthened this notion. Doubt crept in. Was I being weak? Wasn’t everyone suffering in their own way? Was I being overly dramatic? What if they were reading my mind and knew I was wonky? Was I just taking the easy way out by telling myself I couldn’t cope? I did have everything after all. Did I really need help? I did. I’d had enough of just trying to get by. I wanted to live a little more than ﬁnding my way out of my house in the morning and back in at night. And hence began the long road up. Recovery came with its own share of apprehension. The space that had held the suffering earlier had to be ﬁlled with something else and I didn’t quite know what. Hardship had become familiar and comforting. I felt empty and bland. Did healing mean I’d lose all my oh-so-deep insight into life, and with it my inspiration and creativity? Would my days now become mundane? It took much longer to see that life could be far richer than pain and that darkness was not a necessary precursor to unpredictability; stable did not have to mean stagnant, drab or unchanging. most of the time, I can reply with an honest “Pretty normal”. Normal is beautiful. Normal has taken on a meaning I couldn’t see in those few years. It was awful. It isn’t anymore, not even close. Mental illness can be long and hard, and recovery might feel longer and harder, but there is hope. I am still afraid of that place. I’m on high alert a lot of times. 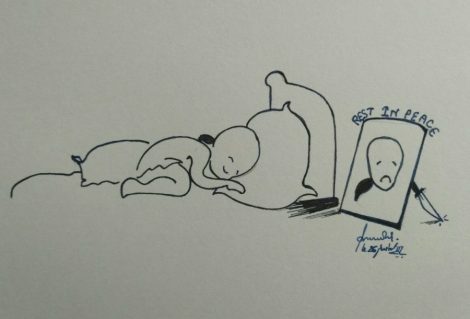 Am I sleeping enough? Do I feel like eating? Am I excited about life? Am I too excited? Oh no, I haven’t been getting out of bed. Oh no, I haven’t been getting into bed. Amidst nightmares of torture, danger and helplessness, sometimes it is a wonder that I can sleep like a happy little baby. But I can and it is okay, all of it. Everything is okay and that is the best feeling ever.